Buying a new RSW chiller for your boat? Published as “What to Look For in an RSW Chiller” in the April 2012 issue of Fisherman’s News. The most common on-board refrigeration system in the fishing industry, besides galley refrigeration, is the Refrigerated Sea Water (RSW) system. For the fisherman that needs to refrigerate his catch, the reliable operation of the RSW system is extremely critical. Inadequate capacity means shorter trips; unreliable operation can mean the loss of the entire catch, as well as the loss of fuel and supply expenses for that trip. When you contract for a new RSW system, how do you know that the system you purchase will meet your expectations? In a highly competitive environment where the purchase price often sells the system, you can easily get shortchanged on capacity. Furthermore, the lack of a properly engineered RSW design can leave you with a troublesome system that costs more to own than any other system on your boat. Both of these problems often have no easy remedy. Selecting a refrigeration manufacturer and installer is very important, but also important is having a basic understanding of how equipment capacity is determined, what kind of equipment is available, and how to get the important information documented on the purchase and sale documents. Here are some frequently asked questions that will put you on top of your game as a purchaser and user of water chilling equipment. Q – I have quotes from several different sources for a 20 ton chiller, and the prices are so different. Why? A – There are a number of reasons, but first you must understand that refrigeration “tons” or “refrigeration capacity” means very little without knowing at what “temperature difference” or TD the tonnage was calculated at. TD is the difference between the refrigerant temperature and the water temperature, and it is directly related to the amount and quality of the heat conductive surface that is doing the refrigeration. Let’s look at this 20 ton chiller – and let’s say that it can do 20 tons of refrigeration when the temperature of the refrigerant is 10⁰F lower than the seawater temperature. The heat from the seawater transfers across a heat exchange surface, and there is enough surface so that as long as the refrigerant is 10⁰F lower than the seawater, then the chiller will produce 20 tons of refrigeration. Now let’s cut the amount of heat transfer surface in half. If you maintain a refrigerant temperature that is 10⁰F lower that the seawater temperature, then you will only produce 10 tons of refrigeration, correct? But if we lower our refrigerant temperature another 10⁰F – giving us a 20⁰F temperature difference across the smaller heat exchange surface, we will regain our original capacity of 20 tons! Now we’ve learned something new: we can purchase half size chillers at half the cost, and still have as much capacity as we want, correct? Not really. The problem is the freezing point of seawater is around 28⁰F depending on regional salinity. A properly designed chiller with adequate water flow can withstand a refrigerant temperature 10⁰F to 12⁰F lower than the freezing point without building ice, but at these temperatures, it is a delicate balance point. A chiller requiring a 20⁰F TD will start to build an ice film on the heat exchange surface when the sea water temperature is around 38⁰F or so – and once a thin film of ice forms, all of the refrigeration effect goes into building ice, and it is very difficult to bring the temperature down below the 38⁰F threshold. Again, once ice filming starts, the chiller is in danger of a catastrophic freeze-up that could irreparably damage the chiller. The lesson here is this: do not purchase refrigeration “tons” without knowing the TD (temperature difference) that refrigeration tonnage is rated at! Q – I see, so what “TD” rating should I be looking for? A – In general, a water chiller will be rated at 10⁰F TD. A chiller with a lower TD – say 6⁰F will be much more expensive to build, but will have increased performance. A chiller with a higher TD – say 15⁰F will be much less expensive to build, but will have greater performance related issues. The reason that 10⁰F is more commonly seen is that it seems to be a good balance point between performance and cost. Q – I’m replacing an old chiller on my fishing boat, and I’d like a chiller that will give me a faster pull-down time. Will a chiller of higher tonnage get me there? A – Installing a larger chiller on an existing system may not necessarily give you more refrigeration capacity. If the old chiller was well matched to the compressor, motor, pump, condenser system, and refrigerant piping sizes, then a larger chiller may give you a small margin of capacity increase – but don’t expect much more without retrofitting the other important components. You need to have your whole system, and the way you operate it properly analyzed for compressor capacity, pump capacity, condensing system, piping sizes, etc. The mechanical engineer must also investigate other refrigeration equipment connected to your system before he can honestly tell you what your new chiller capacity will actually be. Q – I remember the days when you could get those “box style chillers”. I liked them because they seemed to fit well in the companionway between the holds. But I don’t see them very often any more, why? A – You are correct; they fit in tight, square spaces. That was important back when the mammoth carbon steel shell and tube condensers took up so much room. But these days you have much more compact and light weight alternatives to the old heavy box style chiller. The box style chiller also had a host of other problems – they were very sensitive to damage from excessive pump pressure, and limited pump pressures meant limited water flows, resulting in silting. They often had a reputation for being grossly undersized for the tonnage rating – which required very low suction temperatures, and often resulted in catastrophic freeze damage. Another problem is that they were typically made of galvanized steel. Once the galvanizing was eroded away, the remaining life was very short. You can’t get them re-galvanized these days – galvanizers won’t touch used refrigeration coils because they contain entrained compressor oil, which becomes a fire hazard. Q – How about those “plate and frame” chillers? How do they work out? A – On clean fluid systems in the commercial building or chemical industry they are very popular. In the marine and food processing industry, they get mixed results from those who have owned them. They are very sensitive to “silting” – (they get clogged with fine particles easily); but the water distribution area within the chiller is the main weak point as an RSW chiller – it easily becomes clogged with the “stringy” component of fish entrail waste, requiring disassembly of the water inlet piping for cleaning. 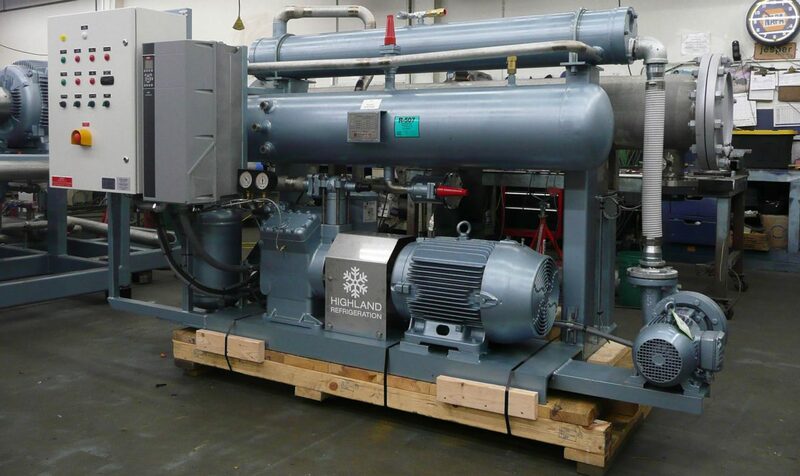 These chillers have the advantage of being extremely compact, and most on the market have fairly honest tonnage and TD ratings, however the silting and clogging problem remains the most prominent disadvantage – and it is an objection that the seller often counters with the fact that they can be disassembled and cleaned. However, you cannot re-use the between-the-plate gaskets, and a new gasket set is extraordinarily expensive. They are also extremely difficult for even experienced technicians to re-assemble without leaks. At the outset, plan on purchasing new and properly rated pumps, oversized sea strainers with high differential pressure shutdown control, keep track of performance so that you don’t schedule an expensive and troublesome teardown unnecessarily, but do plan for teardowns every two or three years, depending on the water you are fishing in. If you are considering purchasing a plate and frame chiller, try to find someone in the fishing industry that has some experience with them. Listen to their experience and consider whether or not your experience will be similar. Q – How about shell and tube chillers? A – The old shell and tube heat exchanger is still the favorite in the industry as long as you stay away from carbon steel and galvanizing. Look into the new titanium chillers – they are truly “forever” chillers that will probably outlast your boat. They are much more compact and lightweight compared with their carbon steel predecessors. Make sure that the shell and tube chiller is arranged so that the refrigerant is in the tubes, and the water is in the shell. With this configuration, a chiller will likely survive an accidental freeze-up. If you design your system so that you are pumping into the chiller and not out of the chiller, then your pump will protect the chiller from the sort of debris that you don’t want going through the chiller, like seaweed, jellyfish, plastic film, net material, etc. Select a chiller with no less than 3/8″ tube spacing. The chiller pump tends to limit the size of foreign material that can pass. If you have 3/8″ tube spacing and adhere to the manufacturer’s GPM requirement, your shell and tube chiller will always stay clear. Cupro-nickel chillers have been popular for years; however there are some reports of discolored flesh in some species, and higher dead loss in live tanks among other species. If you are an aluminum boat owner, consider the galvanic corrosion between the copper and aluminum. Make sure to protect the chiller with a flow switch to detect freeze up condition. Arrange your compressor controls so that the compressor will be disabled if the chiller pump is not running, and if there is inadequate flow through the chiller. Q – So, let’s say that I have selected the best chiller for my boat. How can I know that I’ll get what I am paying for? What is the ambient seawater temperature in the region where your boat will be fishing (57⁰F to 60⁰F in the pacific NW), and what is the final chilled water set point that you need? (Insist on a target temperature no higher than 32⁰F for seawater). What is your fish hold capacity in cubic feet? How much water will you be starting with – for example, tanked to 1/3 full, 1/2 full or fully pressed? What kind “chill-down” time from ambient seawater temperature to the final set point temperature? For example, is a 5 hour chill-down for a fully pressed tank acceptable, or do you require a 3 hour chill-down? This is very important information because it essentially describes the refrigeration capacity of the system. What is the refrigeration capacity of the RSW system in “tons of refrigeration”, based on what evaporating temperature, what chiller TD, what condensing temperature, and what RSW flow rate? Given the refrigeration capacity of the RSW system, how many pounds of fish will that system chill down in one hour, given a fully prechilled tank of water? What is the water flow – in GPM, and what size piping will be required? Selecting the best chiller, getting a written proposal that clearly spells out the parameters and capacities, with a guaranteed performance based on proper insulation and equipment installation, all from a contractor who has a reputation in good standing in the industry, will give you the best chance of success!